There are eight candidates on the Democrat side of the ballot hoping to be the challenger to current GOP Governor Larry Hogan. On a gorgeous, almost summer-like day on the Eastern Shore, only four of them could be bothered to come to Salisbury University to address their would-be primary electorate. Originally that was supposed to be five of the eight, though. The lineup as originally intended: Alec Ross, Krish Vignarajah, Rushern Baker, Jim Shea, and Richard Madaleno. Prince George’s County Executive Rushern Baker was slated to be there, but informed the event organizers 15 minutes beforehand that he had an “emergency” and could not appear. According to his Twitter feed, he had begun the day campaigning in Baltimore City but the trail grows cold afterward. Yesterday evening there were Tweets and social media posts touting his previous endorsement by Congressman Steny Hoyer (who represents a portion of his county) and a piece touting his partnership for STEM training, but no mention of the forum or an apology for missing it. A Democrat friend of mine remarked afterward that “I know quite a few people who were definitely upset and said they wouldn’t vote for him now even if they had considered him before.” Unfortunately, that left us with a group of what would be defined as “second-tier” candidates who are polling in low single digits – combined they’re not Baker’s equal polling-wise. On top of that, State Senator Richard Madaleno was a few minutes late, missing the opening statement but being allowed to make up for it when he answered his first question. Apparently there was an accident on the Bay Bridge, which was the topic of a subsequent question. So the order was set, and placeholders were rearranged. This photo was taken once Madaleno arrived. 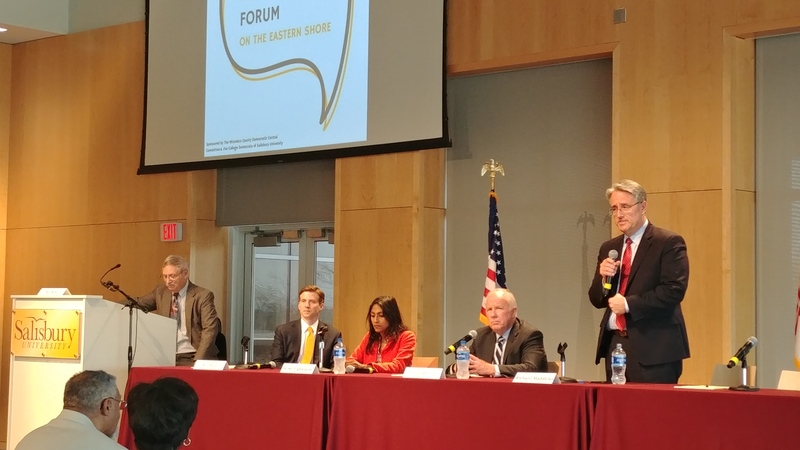 State Senator Richard Madaleno (right) answers a question as moderator Don Rush of Delmarva Public Radio (far left), Alec Ross (second from left), Krish Vignarajah (center), and Jim Shea (second from right) look on. The Wicomico County Democratic Central Committee co-sponsored the event with the Salisbury University College Democrats, and aside from the horribly uncomfortable chairs we were forced to sit in for two hours the event was well-conducted for the 100 or so in attendance on this beautiful afternoon. I learned that a group of liberal Democrats can sit and listen attentively, so now I expect that same behavior at the next Andy Harris town hall that I attend. Moderator Don Rush instructed the audience early on to keep their reactions to themselves, and they complied. Health care – a single-payer system? But I want to begin with separate categorizations of their opening statements, and I’ll proceed in the order that they spoke. This means Alec Ross goes first and Richard Madaleno goes not at all because he was tardy. You may recall that I spent a few minutes speaking to Alec at the Tawes event last year, when he informed me that he had a rather unique view on education for a Democrat, since he focused more on vocational education than college readiness. Obviously coming over here is something he cherishes, as he recalled childhood vacations spent in Ocean City and told the crowd his blood pressure comes down when he crosses the Bay Bridge as part of his opening statement. His main point, though, was that “talent is everywhere, but opportunity is not.” And while “we are bringing new faces and new ideas to the Democratic Party,” Ross noted their voter registration numbers are trending downward. Krish came to America as a infant, emigrating from Sri Lanka with her parents. (A few years later, Sri Lanka would be embroiled in a civil war, so tensions were rising at the time.) She also painted a gloomy picture of Maryland, telling the audience that “opportunities are declining” but she would be “Larry Hogan’s worst nightmare” as a candidate. “We need to give people a reason to vote,” she exhorted. Jim Shea used the Bay Bridge as an example of how infrastructure could help the economy. He was running to “invest in Maryland,” with a focus on three areas: education, transportation, and infrastructure. Leading off the questioning was one about new economic engines for the Eastern Shore. All of them agreed agriculture was going to remain the primary driver, but they also wanted to add green energy to the mix in various ways. For Vignarajah, the object wasn’t to attack “Big Chicken” but to address its environmental issues through research. She also touted the idea of tourism, both as part of an “outdoor economy” and “heritage tourism.” Shea stressed his belief that we need to bring the two sides of farmer and environmentalist together. Corporations want a good environment, too, he said, but “we need clarity on the regulations.” Jim also believed that we needed to grow our own businesses and not work as much at attracting those from other states. So how do you balance agriculture and the environment? Would you add restrictions to the poultry industry? Madaleno, Shea, and Vignarajah all touted the Community Healthy Air Act, a measure Madaleno sponsored during the last General Assembly session, and one that Shea said “made sense.” (It did not get beyond the hearing stage.) Alec and Krish also brought up the Phosphorus Management Tool, with Krish calling it a “win-win.” She also proposed to “empower” farmers with a Farmers Rights Act. Ross wanted all sides to play by the same rules as well, saying that neither side thinks they are lying when it comes to the facts. Needless to say, all of them were supportive of wind energy development. Madaleno said they “will make a lot of sense,” believing the won’t impact the viewshed and be the basis for job growth. They can “drive the economy ahead,” added Shea; however, he was concerned that there was no way to store their energy. We need to invest in that technology, he added. Ross and Vignarajah were just as aggressive, with Alec comparing areas that don’t “embrace the future” through wind to the coal country he grew up in and assuring us that windmills would not keep them from the beaches. Vignarajah promised 2,000 megawatts of wind power in her first term and chided Larry Hogan for not being proactive. We are exporting our dollars and importing their pollution, she said regarding the current situation. When it comes to watermen and the Bay, the answers were again rather similar because they focused more on the Bay, with some expressing the recovery of the oyster population as one positive development. It’s a “win-win” to support the oyster industry, said Vignarajah, but don’t forget the tributaries to the Bay like the Choptank, Potomac, and so forth. Shea warned that it’s “too soon” to harvest oysters as watermen are pleading with Governor Hogan to allow. And while Ross would do “whatever it takes” to accomplish this difficult and expensive work, he spent part of his time noting that “when you drive into Maryland, you should be entering The Resistance.” Chiding the “abhorrent” leadership at the EPA, he wanted a set-aside to sustain watermen. Shea temed a similar concept as an “investment” in the needed vocational training for the “social costs of our advancement.” On the other hand, Vignarajah expressed the “unpopular” view of crediting Larry Hogan with trying to protect Chesapeake Bay funding. As far as transportation priorities for our rural areas are concerned, there was no real shock in their answers. Krish led off by saying “let us try to be innovative,” making the investment in our economy of extending the MARC system to Salisbury and Ocean City as “an attraction” to provide “more mobility.” Jim Shea agreed that the Eastern Shore has a lack of mass transit. Madaleno and Ross blasted Larry Hogan’s transportation plan, with Ross calling it “a press release” and “not realistic” because it mainly focuses on DC and Baltimore. Hogan was “one of the luckiest politicians around,” said Madaleno, who noted that the Purple Line was “placed on a credit card” while the gas tax Hogan criticized was now being used for highway widening. Richard would invest in “smart mass transit,” meaning on demand. Shea was more realistic, calling transportation “anathema” for career politicians because projects take so long. He termed the high-speed rail project backed by Hogan “pie in the sky” and would vet his plan with citizens around the state. Most telling to me was part of Alec’s answer, where he called widening U.S. 50 “looking backward” and mass transit “looking forward.” So I wasn’t shocked by their answers to the next question, about a third Bay Bridge. At least Jim Shea was honest enough to answer “I don’t know what the correct answer is.” (Hint: look at how close Dorchester and Calvert counties are.) His bigger issue was funding education. Madaleno was more worried about whether the current bridges survive, as the Hogan toll reductions “restrict the decision” on these bridges, which Madaleno would replace there. Alec and Krish were even more blunt. “People need investments in them,” said Ross. High-speed connectivity and schools were a higher priority in his eyes, with another Bay span “way down the queue.” Vignarajah echoed the sentiment: “A lot of priorities are ahead in the queue” over the Bay Bridge, adding “we have a 1950s budget in many respects.” She would spend money on universal broadband, too, noting 1 in 12 Maryland residents don’t have high-speed internet access. Since it had been hinted around at, the focus shifted to education. Education “will be the centerpiece of (a Madaleno) administration,” said Rich, and “this is why (Ross) is running for governor,” he said, but all of them were ready to give free stuff out: universal pre-K and community college were most mentioned. One thing I did like about Alec was his advocacy for vocational education, rather than the “terribly elitist” idea all kids have to go to college. He promoted an online academy to assist rural students in receiving services not otherwise available to them and advocates for universal computer science education. We also waited until nearly the end to learn about their proposals for health care, and whether it included single-payer? Of course it does, but not everyone is as honest as Jim Shea, who, while he told the audience that “a single-payer system is something we will eventually move to,” it wasn’t practical for a single state to adopt. That push had to be at a federal level, but we could control costs locally through a collaborative approach. Alec called on us to “resist the evil that is coming out of Donald Trump’s Washington.” While he admitted that “we have to continue to play defense,” he gave an example of something he would do differently: because of the waiver system Maryland was benefiting from, Medicare for All wasn’t possible – but Medicaid for All as a public option was. I was honestly surprised by the final question, which had to do with redistricting. Had there been five participants, the health care question would have likely been last. Only the American system allows for politicians to pick their voters, said Krish, but it was a “problematic” issue that had to be addressed at a national level. Shea disagreed, saying that while gerrymandering had polarized us, it wasn’t a federal problem – but the solution wasn’t (as he called it) “unilateral disarmament” here in Maryland. It needs to be “fair and smart,” Jim added, but he warned there’s no such thing as a non-partisan group. Madaleno admitted that the gerrymandering “got out of hand” during the O’Malley administration (but failed to mention his lack of objection at the time.) Going with the theme that “the Koch brothers have bought the Congress they wanted,” Rich wanted to reform as part of a multi-state compact. Alec saw the issue as part of the “damage to democracy,” which has led to both far-right and far-left factions in Congress. “We need representatives to engage with everyone in the district,” he said. It should be noted that Vignarajah used part of her answer time to express her disappointment that no question was asked on opioids. “We need action” on both the over-prescription and treatment aspects of that problem. Alec Ross told the local Democrats that it’s “more about ‘we’ than ‘me,’ but disagreed with Madeleno on one point: the GOP is not coming apart. “We’ve got to work for it,” he said. He also promised “no one will be more anti-Trump than me,” but warned the group they “can’t just resist,” they have to have an “aspirational agenda.” It was time for new faces and new ideas to come forward., Ross concluded. “How do we beat Larry Hogan?” asked Krish Vignarajah. “No man can beat Larry Hogan, they say. Well…?” While Hogan “fakes left and moves right,” Vignarajah pointed out that 61% of those who toppled incumbent Republicans in this cycle were women. She pledged a “fiscally responsible. socially progressive” administration. They did their thing and I did mine, but mine is done. Consider this an open letter to the 16 or 17 Republican presidential campaign teams. From the sound of it, we are planning to do our Wicomico County Lincoln Day Dinner in early November. Originally we wanted to get Larry Hogan as our speaker, but so did everyone else and then he announced he’s fighting stage 3 non-Hodgkin’s lymphoma. Given the length of the course of treatment, it’s not likely he’ll be doing a great deal of traveling and public appearances during that time – however, should he decide to drop by the door is certainly open. I’m sure Larry would be gracious, even if it wasn’t his endorsee Chris Christie doing the talking. Yet it’s always been puzzling to me as to why we in Wicomico County can’t get a better “name” speaker. After all, we are the “crossroads of Delmarva” and that has to count for something, right? Not only that, we have a wonderful venue at Salisbury University that we have used for several years – the food is always good. Between Maryland and Delaware there will be 54 Republican convention delegates (38 for Maryland, 16 for Delaware.) Even though Iowa and New Hampshire have a more advantageous position on the primary calendar, they only account for 53 delegates between them. There is a potential audience of 102,793 Republicans within the four counties that make up the Lower Eastern Shore of Maryland and Sussex County, Delaware. That doesn’t count unaffiliated and crossover Democrats who are desperate to not vote for Hillary. All of them are within the Salisbury media market, and it’s not like the news in Salisbury has a lot of content. You may get wall-to-wall coverage if you show up. We have a pretty good fundraising scheme in place which we used for the Patriot’s Dinner with Lt. Col. Allen West last year. Lastly, not every Lincoln Day Dinner actually has a Lincoln. We do. He might even bring some Union troops along. Generally our Lincoln Day dinner gets between 100 and 150 people – but I see no reason we couldn’t get 300 to 400 with the right candidate. The optics of a sold-out venue would be a shot in the arm for any campaign, so why not take advantage? You can’t let Donald Trump be the last one to show up at a Maryland event. Back in 2012, the all-but-lost cause of Newt Gingrich came to Salisbury and drew plenty of regional attention, so here’s my earnest plea on behalf of the good Republicans of Delmarva: retail politics may well go a long way here. Do it while you’re still in the race this November and it may pay off in a year’s time. Besides, isn’t the old adage “ask and you shall receive?” I’m asking nicely. Author MichaelPosted on July 21, 2015 Categories All politics is local, Campaign 2016 - President, Delmarva items, Maryland Politics, Politics, State of ConservatismTags Chris Christie, Delaware, Donald Trump, Larry Hogan, Lt. Col. Allen West, Maryland Politics, Salisbury University, Wicomico County GOP1 Comment on Mission impossible? On Friday I received the latest update from Newt Gingrich in my e-mail box. Even though I don’t always agree with him as to tactics – and his Presidential campaign in 2012 went nowhere but to Salisbury University – the one thing you cannot take away from him is the 1994 Contract With America, signifying a Republican resurgence in the post-Reagan era. And you have to respect him for thinking years or decades forward, such as he did in this case. His piece on Friday looked at the economic prowess of states which did not collect an income tax in comparison to those that did. It even cited some of the same Art Laffer data that unsuccessful gubernatorial candidate Charles Lollar used in his pitch to eliminate Maryland’s state income tax. But the part which intrigued me came toward the end, when he wrote about the effort by Vince Haley, a State Senate candidate, to eventually eliminate Virginia’s state income tax. Certainly it doesn’t have a great chance of success in the near term with a Democratic governor, but one has to ask what the effects would be if the commonwealth made it all the way down that path – and how would it affect us? For nearly four years, a significant part of the time of my outside job has been spent on the Eastern Shore of Virginia. I’ve been over most of that strip from Chincoteague to Cape Charles for some task or other, but if you just pay attention to the drive along U.S. 13 you can see that the ESV is not the wealthiest area, nor are many ingredients for prosperity present. Compared to Virginia’s 4% population growth as a whole, the two counties which make up the Eastern Shore are leaking population, with Northampton County (the more southern of the two, closer to the Norfolk region) dropping by 2 percent and Accomack County (closer to Maryland) holding almost steady, with an estimated decline of less than 20 people in a county of just over 33,000. By way of comparison, the two combined are less than half the population of Wicomico County, and there are good reasons for that: their geographic isolation at the end of the Delmarva Peninsula and a lack of job opportunities outside of the Wallops Island NASA station. Locally, their slogan is “You’ll Love Our Nature” and that is one thing the area can boast given its coastlines on Chesapeake Bay and the Atlantic Ocean are often less than 20 miles apart and meet at its southern tip. Elected officials of all stripes are trying to increase business at the Wallops Island complex as they see the potential of unmanned space flights from the facility, with the prospect of good-paying ancillary jobs the spaceport creates. But the benefit of not having an income tax would likely be an influx of well-to-do retirees and others with the disposable income residents of the ESV currently lack. It may even be a better attraction than coastal Delaware and its lack of a sales tax, since those outlets are a relatively easy drive away from the northern reaches of Virginia’s slice of the peninsula. Those who try to promote the area probably realize that prospects for certain types of businesses wouldn’t be very good because the ESV lacks some of the infrastructure necessary for manufacturing. But if the area becomes advantageous in a financial sense thanks to an elimination of the income tax, it can become a playground of sorts for affluent retirees who would like to slow down and enjoy a more rural lifestyle, allowing the remainder of the residents to share in that wealth. On the other hand I can also understand where many ESV residents may object to eliminating the state income tax, especially if they receive Virginia’s version of the Earned Income Tax Credit they call the CLI. If all this came to pass, though, Maryland would be left in the middle, suffering from having a sales tax-free state siphoning off its retail industry and an income tax-free state choking off its wealth. (Don’t forget that an income tax-free Virginia may have devastating effects on the capital region of Maryland, too.) Of course, we can work to eliminate both those issues but it would take a larger sea change in philosophy than Annapolis has the stomach for. It may not be the golden ticket to prosperity, but given the slow decline of our Delmarva neighbors to the south a drastic measure like eliminating their income tax may be the only way to resuscitate the area. The big news around these parts today was the announcement that Labinal Power Systems would be closing its Salisbury plant and consolidating operations in Texas. Gone will be an estimated 600 jobs as the plant phases out operations over the next two years. Salisbury’s downtown has been doing well with the increased popularity of 3rd Friday, a successful New Year’s Eve event, the upcoming opening of Headquarters Live – an entertainment venue which is the remodeled former Fire Station 16 – and a popular Thursday – Saturday night trolley service connecting these venues with nearby Salisbury University, but other parts of town haven’t done as well over the last year. The closing of Labinal decreases further the traffic to a once-booming part of the outskirts of Salisbury that formerly boasted the old Salisbury Mall, torn down several years ago for a development that never got off the ground. Everything is cyclical, of course, and one example is the development around the SU campus. But losing these Labinal jobs would be a major blow to a county already on a long losing streak when it comes to year-over-year jobs. And the problem with such a long transition to a shutdown (almost two full years) is that lag time is going to be longer than some potential employers want to wait for the facility. We all better hope that Maryland becomes a lot more business-friendly over the next two years. It’s ironic that Senator Mikulski made a big deal out of a large federal contract secured for the facility just weeks before the announced move to Texas. Call it Rick Perry’s revenge. Author MichaelPosted on January 14, 2015 Categories All politics is local, Business and industry, Delmarva items, Maryland Politics, PoliticsTags Barbara Mikulski, Business and industry, Pork in the Park, Rick Perry, Salisbury Festival, Salisbury University, Third Friday1 Comment on Losing momentum? As they have in previous election cycles, the Salisbury University campus group PACE involved themselves with a candidate meet and greet this afternoon on the SU campus. While it looked somewhat modest at first glance, the event seemed to draw plenty of attention in the end. With participation from both major parties, and plenty of pizza to go around, students had a golden opportunity to interact with those who may be representing them in local and state government. Sadly, there was a disappointing lack of participation on their end, even with plenty of voter registration cards and absentee ballot forms available. There was no shortage of signs, that’s for sure. Nor was there a shortage of candidates. In the hour I spent over there, I spied Republicans Carl Anderton Jr., Addie Eckardt, Bob Culver, John Cannon, Mary Beth Carozza, and Christopher Adams. Democrats outnumbered them slightly, with Rick Pollitt, Laura Mitchell, Norm Conway, Keasha Haythe, Chris Robinson, Judy Davis, and Jim Mathias representing their team. Addie Eckardt was the subject of this WBOC interviewer, but there was also SU press there, too. So participation was very good, particularly on the Delegate level. One thing I like about this type of event is that I get to say hello to my friends across the aisle, so I spoke at some length to Rick Pollitt and Laura Mitchell, and got to meet Judy Davis, who I’d not met before. Of course, I spoke to a number of the Republicans, too. In terms of generating awareness on campus, I’m hoping this was a success. I noticed a lot of people walking by somewhat oblivious to the scene, which is a shame. Thinking back to my days on campus, though, I was somewhat apolitical although I voted in every election – but I don’t recall having an opportunity such as this to connect with my state representatives when I was an undergrad at Miami. PACE should be commended for putting this event together, even with somewhat short notice. I wanted to remind people that I do take advertising, and last night I placed the return of District 38C candidate Mary Beth Carozza on site. It brings up the point that three candidates now believe advertising on monologue is an effective campaign tool, so hopefully after the election businesses will follow. But since I have the floor I may as well bring up a few other upcoming events. For example, a number of candidates – both Republican and Democrat – will be making their case to SU students (and whoever else wants to hear) at Red Square at Salisbury University tomorrow, October 2. I believe the hours are 10 to 2, although I’ve also seen 11 to 2. Eight years ago I covered a similar event there, but this time it will be during the week so participation should be better. We’ll find out. Then this Saturday is Wicomico County’s Super Saturday, where an extra push will be made for our local Republican candidates. The culmination of that day will be a Fall Harvest Party for District 38B candidate Carl Anderton, with guest speaker Delegate Jeannie Haddaway-Riccio. That runs from 5-8 p.m.
A few days later, Republican County Executive candidate Bob Culver is having a aptly-named “Pull the Pork Party” at the Ward Museum on October 14 from 5:30 to 7:30 p.m. Speaking of fundraisers, this site is a relatively informative one for upcoming political fundraisers around the state. The reason I bring them up is because Jim Mathias last night had a high-dollar fundraiser at Brew River which was assisted by our “incumbent protection” friends across the bridge at Rice Consulting. Earlier that morning, Norm Conway had a high-dollar fundraiser, also through Rice Consulting, in his real district with his true constituents – downtown Annapolis at the Calvert House. Next week he will be slumming with the rest of us in Willards (which is now also outside his district) but we know where his loyalties lie now, as the people of his own district must not be good enough for supporting Norm to the degree in which he’s accustomed. But somehow I think he’s getting the Willards Lions Club as an in-kind donation, although the rest of us are paying. Now for something a little more non-political. I’m supposed to get a little more about this in coming days, but I was encouraged to mention that the Eastern Shore Pregnancy Center is hosting their Tenth Annual Labor of Love fundraising banquet on October 16 at the Wicomico Youth and Civic Center the evening of October 16. October will be a busy, busy month. Last night (because by the time I finish this it will be Sunday) the four Republican gubernatorial candidates got together at Salisbury University to discuss their vision for the state, an event which was televised locally and will be made available statewide at a future time. With only one hour to discuss issues, a 2-minute time limit on answers, and questions written by the local Chamber of Commerce – the event was moderated by their executive director, Ernie Colburn – the questions were somewhat predictable given the bread and butter of these campaigns deals with their perception of the state’s sluggish economy. The time constraints only allowed for five questions after a two-minute opening statement and prior to a 70-second close. The five questions had to do with the tax increases and structural deficit, creating a business-friendly tax code, addressing the challenges in attracting jobs, a seat at the table for the Eastern Shore, and restoring highway user funds. I would have liked one more directly addressing agriculture, but we didn’t get the opportunity to write the questions. One other weakness with the format of the debate is that the candidates were placed in alphabetical order, which is fine, but initial responses were not properly rotated. Charles Lollar either answered questions first or last, as did David Craig, while Ron George and Larry Hogan had the benefit of hearing at least one answer. In this narrative, I will discuss the candidates in order of their opening statement, which happens to be alphabetical order beginning with the Harford County Executive. First of all, David Craig perhaps had the best-organized presence there, which included running mate Jeannie Haddaway. Some of Craig’s blue-clad staff were there, but many others had Craig lapel stickers advocating his support of concealed carry. They all sat in one section of the audience, a section which I sat immediately behind. They also had an event close by the University beforehand, so David made a day of it. In his opening statement, Craig made sure to mention his running mate and her ties to SU, from which she graduated. “Jeannie and I are very much alike,” said Craig, referring to their respective families’ long history in Maryland. “I want the twelfth generation (of Craigs) to still live in Maryland,” said David. In adopting a more business-friendly tax code, David pointed out we shouldn’t be taking the dollars in the first place. He proposed slashing the business tax rate from 8.25% to 4% in stages, but also explained that many businesses such as S-corps use a personal tax form to report their business income. He also wanted to address the sales tax, gasoline tax, and tolls. In terms of giving the Eastern Shore a seat at the table, Craig played up his decision to secure Jeannie Haddaway as his running mate. “The Craig-Haddaway ticket is going to have someone (from the Shore) who will always be on the second floor, not just at the table.” He continued by saying Haddaway gave up a safe seat in the House of Delegates to try and benefit her region. Craig also vowed no money to the Red Line or Purple Line and promised that counties will get their highway user funds back in the first year of a Craig administration. He closed by taking a subtle jab at opponent Larry Hogan, saying that we didn’t need to change Maryland, “just change what’s on the second floor.” Between him and Jeannie Haddaway, they were 14-0 in beating Democrats, he concluded. Overall, I thought Craig gave a solid, steady performance. He rightfully played up the presence of Haddaway on the ticket, although I suppose if you were watching from other parts of the state it could be seen as pandering to some extent. Yet of all the running mates, she’s probably the most qualified to succeed David if the unthinkable should happen. Ron George was blunt in his opening statement: “This is about the economy…the other side has not solved one problem.” The facts were ominous, as he told us about 73,000 unemployed Marylanders and a manufacturing sector “still stuck in the recession.” He was a working man, with a career and business he interrupted to serve his fellow citizens. Ron would address the structural deficit by combating waste through independent audits and putting together a Spending Affordability Commission that doesn’t paint such a rosy outlook – they predicted 4.5% GDP growth in FY14 and 6% next year. “These rosy forecasts have got to stop,” said Ron. He would also address the state’s bond situation, where debt service costs the state over $1 billion a year. But he was realistic enough to realize “I can’t go in there as a king,” meaning he can’t just change government overnight. But what we could change, he would – “I’m guaranteeing you the things I’m saying,” said George. Yet he made an excellent point about the challenges to attracting jobs by asking why we look down on the tradesman, instead emphasizing the four-year degree? There’s no focus on that sort of education, Ron added. Being a guy who has an interest in “made in America,” this was one of the two highlights of Ron’s night insofar as I was concerned, with the other coming in the next question. After Ron talked about the Eastern Shore being “in my blood,” he addressed such items as more state money for tourism (with a proposed slogan – “the Maryland Eastern Shore: life as it should be” – bringing back the canning business, protecting farms, expanding broadband, and reducing sales tax on this side of the Bay. But the best idea went back over 50 years, to a time when each Eastern Shore county had its own State Senator. “I think we need to have a Constitutional Congress in this state and go back to something that makes it fair for the Eastern Shore and the rural areas,” said Ron. And while I said 48 Senators (two from each county) I still think it’s an outstanding idea. Ron used the highway user fund question a little differently, making the case that he would be “a governor for all of Maryland” and that helping Baltimore City would assist the rest of the state. But he would repeal the automatic increases in the gasoline tax and instead of a “reactive” transportation plan his would be proactive. He concluded by promising to be a “hard worker” as governor and to treat all fairly, while also mentioning a little about running mate Shelley Aloi, who was also at the event. Something I’ve observed about Ron, though, is that he comes across as ill at ease in a public speaking situation. He also rattled off a lot of numbers in his presentation, and perhaps sealed his image as a policy wonk because he’s also the only candidate who wears glasses. I noticed him looking down reading a lot, instead of looking at the camera. He also had very little presence at the event, which led to his only getting a smattering of applause after questions rather than a rousing ovation. I have no doubt he would be a hard-working governor – and as a policy wonk type myself I loved a few of his ideas and goals – but he’s going to have to overcome a lot to get there. I was surprised that Larry Hogan didn’t have a larger presence there as well. In his opening he alluded to three recent visits to Salisbury University before settling into the familiar bromides of not desiring to be something, but to do something and being fed up with politics as usual. He also brought back the oft-repeated refrain of the state being on the wrong track and the emphasis on jobs, the middle class, and restoring the economy. Of course, in the first question Larry brought up the $9.5 billion in new taxes, but pointed out that he worked for an administration which finished with a cash surplus that’s now once again a structural deficit eight years later. He would cut spending first, then roll back taxes where he could. Recently, Hogan added, he put out a plan to address $1.75 billion just by enacting existing recommendations. After another regular reprisal of those things we’ve lost in terms of businesses, Larry made the case that there’s been “no discernible response” from Annapolis. He asked how an administration could be pro-jobs yet anti-business? “There’s been a war on rural Maryland,” Hogan added. In that respect, Larry is probably correct because each area of the state has needs not being addressed, But as a whole our part of the state is the poorest and tends to have higher unemployment. It could easily be argued we’re already in a recession. He then promised to restore the highway user fund cuts that were “devastating” to local governments, perhaps by chopping away at the 53% of transport dollars spent on mass transit. As a whole, Hogan’s performance came across to me as “meh.” The problem is that I’ve heard it all before, and this particular debate format and questioning lent itself to Hogan’s perceived strengths. Yet he never hit anything out of the park. So when Lollar stated that spending had jumped 36% over the last eight years (including $2.3 billion this year), he announced his intention for a taxpayers’ bill of rights (or TABOR) law to hold spending in check and to phase out the income tax in five years. “How would you love to wake up in five years, in 2019 in Maryland, and not have a personal income tax that you have to pay?” he asked. He repeated the Laffer endorsement in his next answer, as well as the TABOR reference, but added that our legislature and governor doesn’t understand business. “We have a governor who hasn’t had a job in 28 years,” Lollar quipped. But he also dropped a bombshell on the group by proposing term limits. “It’s time for us to get rid of the career politicians,” he opined. Me? I love the idea, but it also has to come with the discipline of keeping the non-elected regulatory state in check. Lollar pledged his running mate, Ken Timmerman, would address the challenge of attracting jobs by using his investigative skills to focus on waste and the 84 new taxes and fees. He also made the case that the biggest challenge to business is simply staying in business. Charles wanted to “make the Eastern Shore a priority,” noting that we don’t get a good return on our tax dollars and would rather just be left alone by regulators. They’re “tired of being picked on,” said Lollar. He also brought up the Hudson lawsuit. As for the highway user funds, Charles promised to stop the Red and Purple Lines, which were enacted under “reckless leadership.” He also wanted an “enforceable lockbox” over the funding. I’m sure Charles may have gained himself some converts around the state with his performance, which was surprisingly strong. Unlike Ron George or even Larry Hogan, Charles seems to thrive in a debate format such as this because he is a passionate speaker. He did fall into the Hogan trap of repeating some points several times, but overall it was a strong, compelling performance. However, there were a few issues with Lollar’s day today. I happened to be sitting amid a few Lollar backers and they were disappointed by the lack of local support at his earlier gathering. Others I spoke to earlier today bemoaned his campaign’s lack of direction. But he’s the only one who has brought concepts like a TABOR and term limits into the conversation – these are broad-based conservative points of view, as is lowering the income tax to extinction. So as for who “won” the debate, I would say it’s Lollar and Craig who did best, with George and Hogan lagging behind. But now I’m a little closer to determining who I will endorse and it will probably be made public in one week. It’s a scenario of “better late than never”, but Democratic gubernatorial candidate Doug Gansler will spend time on the Eastern Shore as part of his announcement tour next week. While he officially started up yesterday across Chesapeake Bay, the Gansler tour will spend the early part of next week working its way down the Eastern Shore, beginning in Centreville at 9 a.m. Monday and proceeding through a noon stop in Easton, a 3 p.m. appearance in Cambridge, and wrapping up at 6 p.m. at Salisbury University. It will be interesting to see who greets him there, given that five local elected officials (County Executive Rick Pollitt, County Council member Sheree Sample-Hughes, and Salisbury City Council members Jake Day, Shanie Shields, and Laura Mitchell) have publicly backed Anthony Brown for governor. The Eastern Shore tour concludes on Tuesday, October 1 with a noon stop in Ocean Pines. Gansler is working from a large polling hole, at least according to a internal Anthony Brown poll released this week (h/t Maryland Juice.) The GarinHartYang poll found Brown had support from 43% of the 608 likely Democratic primary voters, with Gansler at 21% and Heather Mizeur lagging far behind at 5%. But I noticed a couple vulnerable spots. Among those who feel the state is on the wrong track, the O’Malley record seems to be sticking to Anthony Brown because he and Gansler are tied among that group. Moreover, the fact that not even 3 of 5 DEMOCRATS think the state is on the right track should be of concern to Brown and his backers. It will be interesting to see if Democrats still give Martin O’Malley a 73% approval rating as they did in the Maryland Poll back in January; if not, that’s a crack in the Brown armor. Give this a look. It’s interesting that gubernatorial candidate Charles Lollar chose this particular venue as a stop on his announcement tour. This speech was given at the Hudson farm in Worcester County. As a “freedom-loving, pursuit of happiness” citizen, it’s also interesting that Charles has committed to doing a separate fundraiser for the Hudson family and their legal bills from the Waterkeepers’ suit. But I wanted to compare and contrast the Lollar tour (which I unfortunately missed out on because of a heavy workload at my outside job) and the David Craig announcement tour three months ago. The Lollar tour certainly had a larger number and more varied stops than Craig’s did, with Lollar seeming to focus more on private businesses and on the college audience – all four days had a college stop planned within. Lollar made his pitch at the University of Maryland’s main College Park campus, the Baltimore County campus in Catonsville, at Bowie State University in Bowie (a last-minute addition, apparently) and here in Salisbury at Salisbury University. Now some have picked on the minor snafu of Lollar’s bus having a Delaware tag, but this brings up the bigger question of how well the tour went. At least on a local level, it seemed to attract a modest amount of notice from the media but that’s to be expected. It’s a shame I had to miss it, but I’m sure we haven’t seen the last of any of the three major gubernatorial candidates around these parts. For the first of two consecutive months (at least), a gubernatorial candidate graced our Wicomico County Republican Club’s presence – and he brought his running mate along. It meant the attendance was much better than usual, as over 40 crammed into a Salisbury Chamber of Commerce meeting room to hear both David Craig and running mate Jeannie Haddaway-Riccio. After telling the group this was his 21st election – because Havre de Grace had balloting every two years – he introduced running mate Jeannie Haddaway-Riccio, who as David mentioned was the first Eastern Shore resident on a major statewide ticket in two decades. Of course, she really needed no introduction to us as many of those present were represented by her in the General Assembly. Jeannie talked about cutting her political teeth as a political science major at Salisbury University and being involved in student government there, also bringing up the fact later that she strives to preach political involvement to area youth groups such as Girls State, which is annually held at SU. Haddaway-Riccio also spoke about working in the House of Delegates, “fighting until we barely had an ounce of energy left” against some of the bills presented by the present governor and Democratic leadership. The implementation of that “leftist agenda” has led to “degradation,” Jeannie added. Once both had spoken and David added a quip about needing a couple good Senators – looking at Delegate Mike McDermott, who was in attendance and has been gerrymandered into sharing a single-member House district with another delegate – Craig opened up the floor to questions. Topmost on the mind of those attending was the idea of an open GOP primary, as the idea has reemerged as a discussion topic over the last few days. Craig was noncommittal on the concept, stating he would be satisfied with letting the state party make its decision this fall. There are “a lot of frustrated Democrats” who may welcome the idea, though, added David. Craig was then asked what functions he would assign to Haddaway-Riccio. While he chided Democrats for “picking for an election.” David said of Jeannie, “she should be at the table all of the time,” meaning ready to take the reins if needed. He praised Haddaway-Riccio for her practical experience, common sense, and knowledge of rural Maryland. Asked about business, Craig intended to hold quarterly business roundtables. Because it affected local businesses in advance of consumers, we knew about the recession back in 2008, said Craig, and Harford County made budgetary decisions in a proactive fashion based on that knowledge. “We created local government for a reason,” continued David, revealing there were now more planning and zoning mandates on his county now than there are public safety ones. That same philosophy guided David on education, where he made the case “money should follow the child” and that teachers should be allowed to teach to something other than a test. David cautioned against expecting sweeping changes right away, though, noting the state Board of Education is appointed in five-year terms. After Craig finally finished speaking, we returned to our normal order of business, with one exception: we sang “Happy Birthday” to the man we call “Mr. Republican” locally: Blan Harcum turned 90 years young. In turn, the June meeting minutes were read and approved, treasurer’s report was given, and WCRC president Jackie Wellfonder reminded us of upcoming municipal elections in Annapolis and Frederick which could use our help if interested and the August 1 joint meeting with the Republican Women of Wicomico on Agenda 21, featuring Grant Helvey. In his Central Committee report, our David – county Chair Dave Parker – stated that “Tawes was fun” but we had business to attend to now: the question of opening the primary would come down to Central Committee members so those interested should express such to these local representatives. “Give us grief” if you don’t like our position, said Parker; however he added, “I remain to be convinced” on the merits. After decrying the “truly disgusting” media treatment of the Trayvon Martin case, Dave shifted gears and cajoled those attending that we are still looking for candidates for next year. Some incumbents have alerted us to their intentions, but others have not. Finally, we heard from a number of those attending on various pieces of business: Joe Ollinger reminded us that Crab Feast tickets are now on sale (in fact, I have some to sell if you want one) for the September 7 event. Finally, Delegate Mike McDermott declared that Craig/Haddaway-Riccio was “a great ticket” and hinted at his own announcement in August. “We’ll take that Senate seat from Jim Mathias,” McDermott promised. Speaking of local eateries, it should also be mentioned that the pre-meeting happy hour – this time at Evo – was our most successful, with several tables of Republicans enjoying the camaraderie. Our next happy hour may or may not be there, but we already have the second in what could become a monthly series of gubernatorial hopefuls joining us during our regular meeting as Charles Lollar drops by on August 26.